With increasing regulation and competitive pressures, ship owners place renewed focus on crew welfare, Suzanne Brincat Dowdall of AML-Atlantis Management Ltd says. While the manning of vessels has become a challenge for ship owners and managers in today’s marketplace, AML-Atlantis Management Ltd is ensuring the highest standards in crew management. The maritime industry has seen a number of regulations being introduced over the years, the most recent being the Maritime Labour Convention (MLC) 2006 that came into effect in August 2013. The MLC 2006 legislation created the need for changes to be made by ship owners and managers to be compliant both on board and ashore. One of the requirements is that companies involved in the recruitment industry have to be certified as a Seafarer Recruitment Placement Service provider, a certificate which AML has obtained through Lloyd’s register. Q. Can you give MaltaProfile a brief overview of the history and your key areas of expertise? AML has been established in Malta since 2002. We specialize in Crew Management and Ship and Yacht Registration under the Malta Flag. Our expertise in Crew Management is offered to owners through our management team who have more than 20 years’ experience in the industry. Our team of ex-Deck Officers, lawyers, accountants and tax specialists offers a complete service ensuring full compliance with Malta regulations. The company specializes in dry cargo vessels through its network of agents in the Philippines, Ukraine, Poland, Germany and Malta. AML supplies ship owners/managers with STCW qualified crew from its pool of repetitive seafarers who have high performance records of service contracts with the company and who have passed a thorough medical examination, ascertaining their fitness for their position on board. Crew welfare is top priority for us and as a result of this our clients experience one of the highest crew retention rates in the industry. Q. Ship owners highlight that finding crew is one of the biggest challenges that they are facing nowadays. How does Atlantis Management assist owners in this regard? The quality of officers and crew are one of the most important factors in the management of a vessel. We have a pool of seafarers available, many of whom have already worked on the vessels we are managing. They have very good performance records. We have vetted them, we have seen them on the job, trained them, and they are medically fit. This means that ship owners benefit from getting the best crew for their specific requirements. We can supply all ranks onboard ranging from master to deck cadets and of different nationalities. We work mostly with Filipino and Eastern European crew. We also have our agents in their country of residence who interview the seafarers on our behalf and vet their certificates. Our own representative in the Philippines interviews, trains and briefs crew members and maintains our high standards. Some flag states have nationality requirements. Other flag states, such as Malta, have no requirements on nationality, so unless the owner has any specific requirements or preferences, we recommend crew that we think fits best with the needs of our clients. Q. Can you comment on the current and future availability of crew? Young people in general are faced with several sociological concerns when considering the maritime profession such as separation from families and friends which is less acceptable in contemporary society. On the other hand, countries such as the Philippines and India encourage the development of marine training facilities and have become the leading providers of seafarers to the industry as they offer a better alternative than staying ashore. For Philippine nationals seafaring comes naturally as they come from families having a seafaring background, and going to sea is a normal process for them. We employ quite a number of Maltese, while we also sponsor cadets and help them get their sea time so that they can continue studying to become Officers. However, a seafaring career does not necessarily mean that one has to retire as a seafarer. As I mentioned, some of our onshore staff are ex-seafarers who have the advantage of understanding the operational side of a vessel since they have experienced life on board. Q. What are the latest regulatory developments in the area of crew management? The Maritime Labour Convention (MLC) 2006 has greatly improved the working conditions of seafarers as this regulation ensures that seafarers have the right to a safe and secure workplace, fair terms of employment, decent working and living conditions on board the ship, and clear rights to health protection, medical care and other social protection. Another requirement is a financial security guarantee for the vessel for the payment of salary as well as repatriation, all to the benefit of seafarers. Crew management has been affected by the MLC 2006 in areas such as contracts of employment, verification of seafarers’ certificates, wages and hours of work, obligations with regard to crew welfare and social security protection. Q. In terms of ship registration, what are the key benefits of the Malta flag? The Malta Registry offers numerous benefits to owners wishing to register their vessel under the Malta Flag. One important element is that there are various options on how to register a vessel. The Malta registry allows both the set-up of a Maltese company or the use of an international company. In the case of an international company, the appointment of a resident agent is necessary and that is a service we provide. The process of setting up of a Maltese company is quick and the formation costs are low. 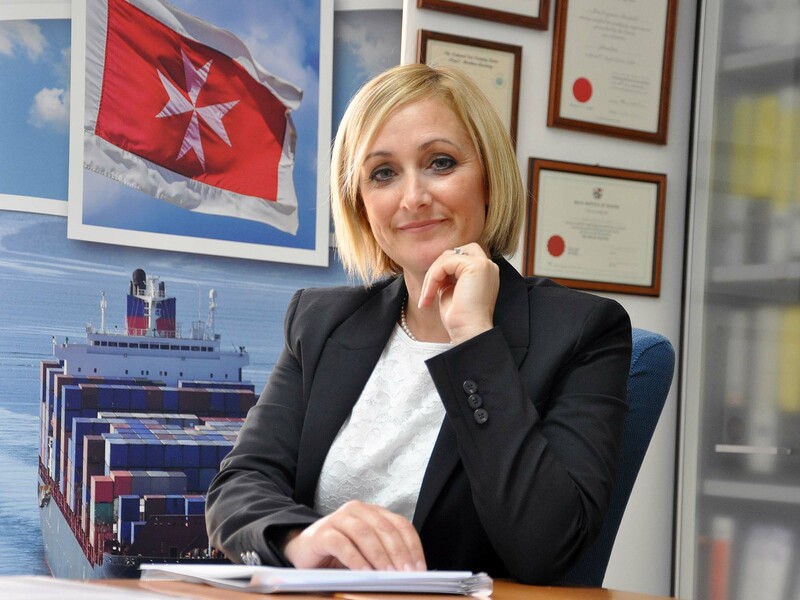 Registration under the Malta flag also offers owners very competitive registration fees and progressive reduction in registration and tonnage tax costs for younger ships. A Malta-flagged vessel has no trading restrictions and can sail worldwide as opposed to some other flags. Maltese ships have also preferential treatment in certain ports, and Malta is a party to the major international conventions. The Malta registry offers a 24/7 service and registrations can be done at any port any time of the day. This is advantageous due to the time difference between countries and gives flexibility to owners when reflagging a vessel. Also it must be underlined that The Malta Flag is a flag of confidence which is on the “white list” of the Paris MoU and is considered to operate under the highest technical and safety aspects. Q. What are the major challenges that your company is facing, and where do you see opportunities for expansion? Our biggest challenge is to keep abreast with all the changes in our industry, and keep up to date with changes in legislation, technical requirements and to constantly innovate so that we can meet and exceed our clients’ expectations consistently. Whilst remaining competitive in our rates we support our clients during the difficult times that the shipping industry is going through at the moment. At AML we do not compromise on quality because for us the safety of our crew and the protection of the environment is our top priority. AML – Atlantis Management Ltd.